The English bulldog is a brawny little powerhouse whose characteristic crablike waddle exudes great strength, stability and vigor.The English Bulldog is a wide, medium-sized, compact dog with short legs. The body and head are massive with extra skin on both the skull and forehead falling in folds. The cheeks extend to the sides of the eyes. The muzzle is wide, short and pug with a broad, deep stop. The black nose is broad with large nostrils. The dark eyes are deep set. The rose ears are small, thin and set high on the head. The jaws are massive, very broad, and square with hanging upper lips. The teeth should have an under bite. The tail is either straight or screwed and carried low. The short, flat coat is straight, smooth and glossy. Coat colors include red brindle and other shades of brindle, solid white, solid red, fawn, fallow, piebald, pale yellow or washed-out red or white or a combination of these colors. The Bulldog is a medium-sized breed of dog commonly referred to as the English Bulldog or British Bulldog. 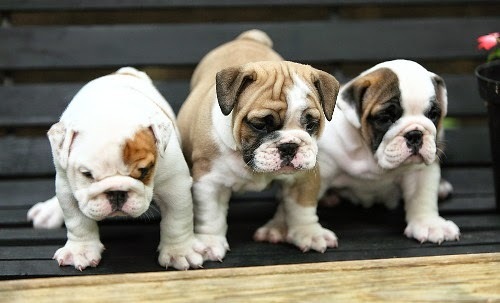 Other Bulldog breeds include the American Bulldog, Old English Bulldog , Olde English Bulldogge, and the French Bulldog. 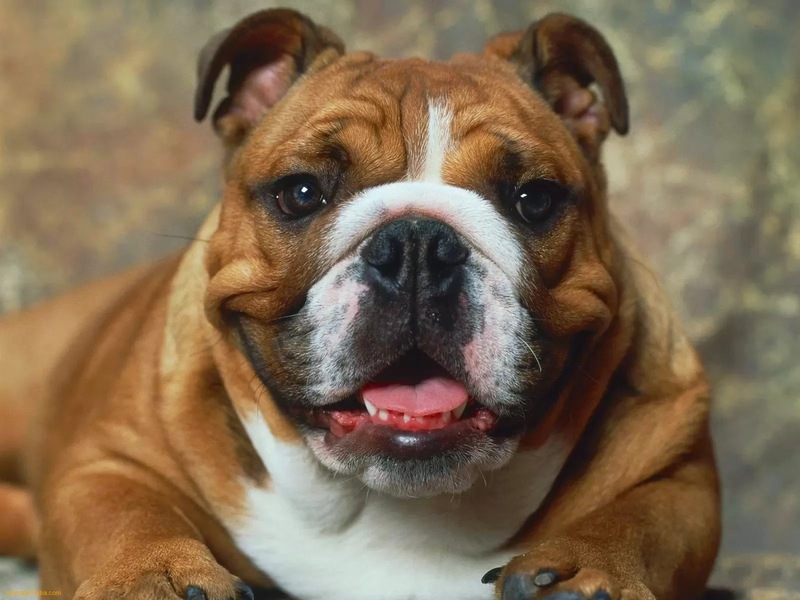 The Bulldog is a muscular, heavy dog with a wrinkled face and a distinctive pushed-in nose.The American Kennel Club , The Kennel Club , and the United Kennel Club oversee breeding standards. Bulldogs are the 5th most popular purebreed in the United States in 2013 according to the American Kennel Club. Laughter, love and a face everyone adores ensure the enduring popularity of the Bulldog. He's a gentle family companion today, but he was originally bred to fight bulls for sport – a past that, combined with his stalwart devotion, has made the breed the mascot of a number of colleges as well as the United States Marine Corps. No breed is more admired for the qualities of loyalty and determination that the Bulldog represents. 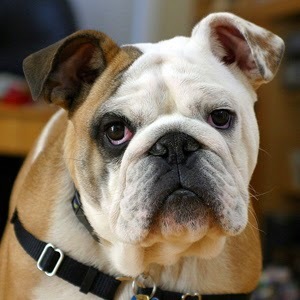 Few breeds are as easily recognized as the Bulldog, with his wrinkled mug, distinctive underbite and Churchillian jowls. Sometimes referred to as the English or British Bulldog, he's a short, sturdy dog with a bow-legged gait, weighing between 40 and 60 pounds. 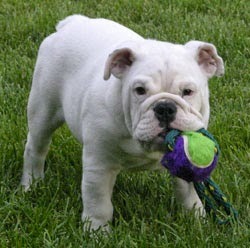 If all you're talking about is personality and temperament, the Bulldog is just about perfect. He loves children and is very easy to train as a family pet. He's an endless source of amusement, clever and very affectionate. He’s also an attention magnet everywhere he goes. The Bulldog may be perfect in spirit, but in the flesh, he’s a different story. These dogs are intolerant of warm weather, and may die if overheated. Too much exercise or stress can make it difficult for them to breathe. Without exception, Bulldogs must live indoors, and need air conditioning in all but the mildest summer weather. Most Bulldogs are born by C-section. Because breeding them is expensive, the puppies are, too. Love is an expensive proposition when you own a Bulldog. In general, the Bulldog is an easy-care breed. His exercise needs are manageable for even the most dedicated couch potato, and he doesn’t tend to be a picky eater. He has a short coat that doesn’t require any fancy grooming, but he does have some special needs when it comes to skin care. Last but not least, it’s important for him to live in air-conditioned comfort, not only to prevent heatstroke but also because he loves his family and wants to be with them. He’s not a dog who can or should live outdoors. Bulldogs can be stubborn and lazy. Your mature Bulldog may not be very enthusiastic about going to a walk, but it's important that he is exercised every day to keep him fit. Bulldogs can't tolerate heat and humidity. When your Bulldog is outdoors, watch him carefully for signs of overheating and take him inside immediately if he starts to show distress. Some people put kiddy play pools filled with water in a shaded spot for their Bulldogs to lie in when the weather is warm and everyone is outside. They definitely are housedogs and should not live outdoors all of the time. Bulldogs are sensitive to cold weather. 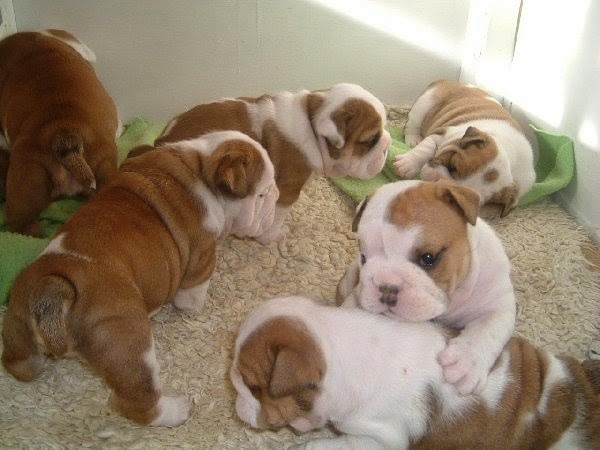 Because of the size of their heads and fronts, Bulldogs have difficulty giving birth. Most require caesareans to deliver their puppies. It isn't advised for inexperienced breeders to try to breed them. As a short-nosed breed, Bulldogs are sensitive to anesthesia. Be sure to talk with your vet about this before any surgeries are done. The Bulldog has a distinctive walk: a loose-jointed, shuffling, sidewise roll. Many Bulldogs breathe in a labored fashion and it’s often difficult for their bodies to dissipate heat. Bulldogs can’t swim. Their massive head, solid torso and short legs limit their ability to stay above water. If you have a pool, spa or pond on your property, limit your Bulldog’s access to it. 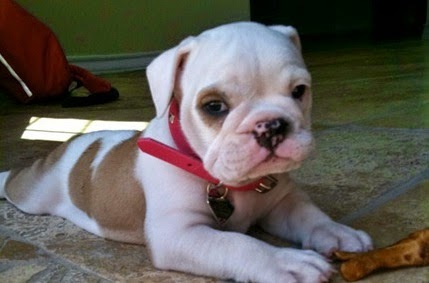 The Bulldog’s smooth coat can be brindle, solid white, solid red, fawn or fallow, or piebald. 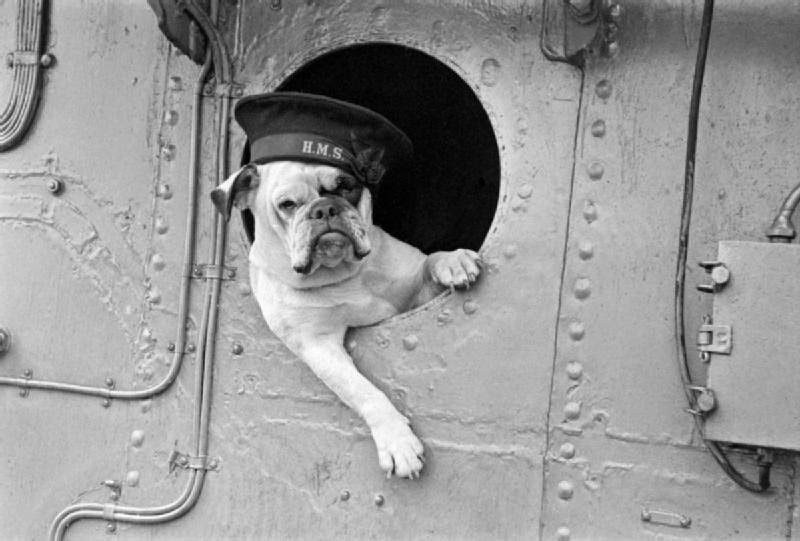 The term "Bulldog" was first mentioned in literature around 1500, the oldest spelling of the word being Bondogge and Bolddogge. The first reference to the word with the modern spelling is dated 1631 or 1632 in a letter by a man named Preswick Eaton where he writes: "procuer mee two good Bulldogs, and let them be sent by ye first shipp". In 1666 Christopher Merret applied: "Canis pugnax, a Butchers Bull or Bear Dog" as an entry in his Pinax Rerum Naturalium Britannicarum. The designation "bull" was applied because of the dog's use in the sport of bull baiting. This entailed the setting of dogs onto a tethered bull. The dog that grabbed the bull by the nose and pinned it to the ground would be the victor. It was common for a bull to maim or kill several dogs at such an event, either by goring, tossing, or trampling. Over the centuries, dogs used for bull-baiting developed the stocky bodies and massive heads and jaws that typify the breed as well as a ferocious and savage temperament. Bull-baiting, along with bear-baiting, reached the peak of its popularity in England in the early 1800s until they were both made illegal by the Cruelty to Animals Act 1835. This amended the existing legislation to protect animals from mistreatment and included bulls, dogs, bears, and sheep, so that bull and bear-baiting as well as cockfighting became prohibited. Therefore, the Old English Bulldog had outlived its usefulness in England as a sporting animal and its active or "working" days were numbered. However, emigrants did have a use for such dogs in the New World. 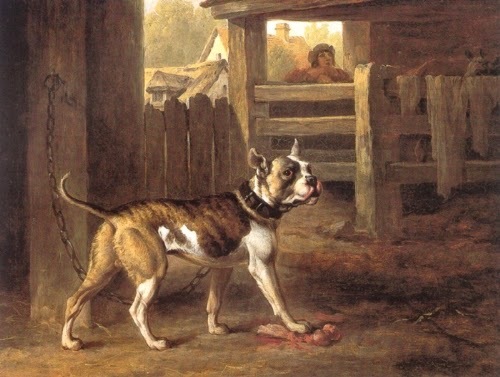 In mid-17th century New York, Bulldogs were used as a part of a citywide roundup effort led by Governor Richard Nicolls. Because cornering and leading wild bulls were dangerous, Bulldogs were trained to seize a bull by its nose long enough for a rope to be secured around its neck. 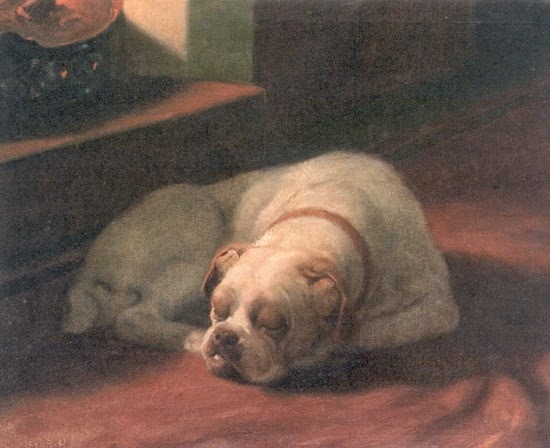 Bulldogs as pets were continually promoted by dog dealer Bill George. Despite slow maturation so that growing up is rarely achieved by two and a half years, Bulldogs' lives are relatively short. At five to six years of age they are starting to show signs of aging. The oldest single breed specialty club is The Bulldog Club, which was formed in 1878. Members of this club met frequently at the Blue Post pub on Oxford Street in London. There they wrote the first standard of perfection for the breed. In 1894 the two top Bulldogs, King Orry and Dockleaf, competed in a contest to see which dog could walk 20 miles. King Orry was reminiscent of the original Bulldogs, lighter boned and very athletic. Dockleaf was smaller and heavier set, more like modern Bulldogs. King Orry was declared the winner that year, finishing the 20-mile walk while Dockleaf collapsed. The Bulldog was officially recognized by the American Kennel Club in 1886. Sociable and sweet, but with a reputation for courage that makes him an excellent watchdog, the Bulldog is a lover, not a fighter. He's dignified rather than lively and has a kind although occasionally stubborn nature. The Bulldog is friendly and easygoing; he gets along with everyone. He can be a slow learner, but once he knows something, he's got it for good. Bulldogs don't tend to be barkers. Usually their appearance alone is enough to frighten off intruders. Temperament is affected by a number of factors, including heredity, training, and socialization. Puppies with nice temperaments are curious and playful, willing to approach people and be held by them. Choose the middle-of-the-road puppy, not the one who's beating up his littermates or the one who's hiding in the corner. Always meet at least one of the parents-usually the mother is the one who's available-to ensure that they have nice temperaments that you're comfortable with. Meeting siblings or other relatives of the parents is also helpful for evaluating what a puppy will be like when he grows up. Like every dog, Bulldogs need early socialization-exposure to many different people, sights, sounds, and experiences-when they're young. Socialization helps ensure that your Bulldog puppy grows up to be a well-rounded dog. Enrolling him in a puppy kindergarten class is a great start. Inviting visitors over regularly, and taking him to busy parks, stores that allow dogs, and on leisurely strolls to meet neighbors will also help him polish his social skills. Prone to breathing problems; some have small windpipes as well. Also poor eyesight, cherry eye, very susceptible to heatstroke in warm weather or hot rooms and cars. Very cold sensitive. Prone to mast cell tumors. Birth defects are common in some lines. Susceptible to skin infections, hip and knee problems. Prone to flatulence, especially when fed any other type of food other than their regular dog food. Puppies are often delivered by caesarian section. 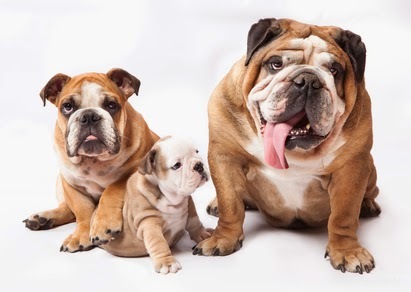 Some say it is because of the dogs’ large head size, however others claim you can hardly tell the difference between the head size of a Bulldog with the head size of other breeds when the pups are first born; claiming not enough dams are given the opportunity to try and deliver naturally because of the large head myth. A lot of Bulldogs do run the risk of having weak labors and this could increase the risk of a caesarian. Many Bulldogs tend to wheeze and snore, while some drool because of their short snouts and outward protruding lower jaw. These are normal physical side-effects of the breed. Because of the compressed nature of the jaw, extra care needs to be taken in keeping the teeth clean. Early dental care, with daily brushing, will get your Bulldog in the habit so that it is grooming time that is looked forward to. Minimal coat care is needed for this dog, but the folds around the tail and facial wrinkles should be cleaned every day to prevent build up of dirt or rubbish. Failure to perform this regularly can lead to infection of the skin. Bulldogs love their daily outings, however, do not expect them to walk or jog long distances, or dart from great heights. The short-hair and snout of the Bulldog make it sensitive to extremely hot and humid climates, and most do not enjoy swimming. Using sun screen lotion on the dog's skin if you are going to be spending time in the sun, and making sure your Bulldog has plenty of water is essential for healthy days out. The English Bulldog needs to be taken on a daily walk to fulfill its primal canine instinct to migrate. Those individuals that do not get this need met are more likely to have behavior issues. While out on the walk the dog must be made to heel beside or behind the person holding the lead, as in a dog's mind the leader leads the way, and that leader needs to be the human. Teach them to enter and exit all door and gateways after the human. English Bulldogs that are in good shape are capable of moving very quickly for short periods of time. 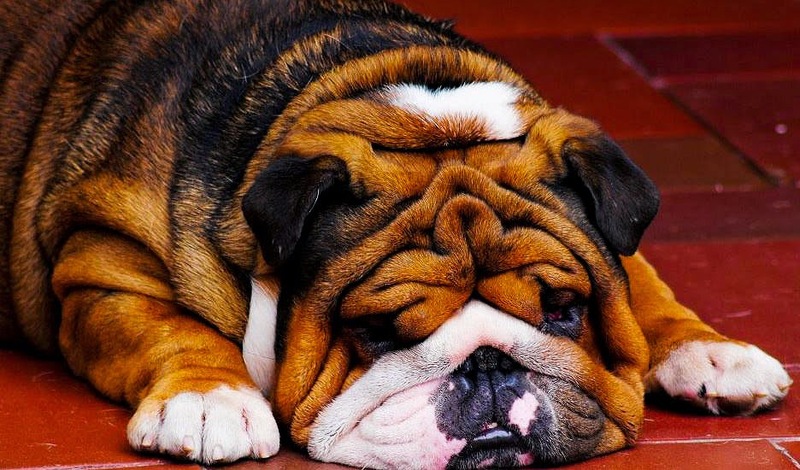 The Bulldog’s coat is easy to groom, but his wrinkles need some special care. Here’s what you need to know. Brush the Bulldog’s short coat three times a week with a rubber curry or a soft bristle brush to keep it shiny and healthy. If you keep him well brushed, he shouldn’t need frequent baths. Bulldogs don’t normally shed heavily, but during spring and fall you may see a little more hair coming off when you brush. Step up the brushing until the shedding period ends. Caring for the facial and nose wrinkles requires a bit more effort. Depending on the individual dog, wrinkles may need to be cleaned a couple of times a week or every day. Wipe out the crud from the wrinkles with a soft, damp cloth or a baby wipe, then dry them thoroughly. If moisture is left behind, wrinkles become the perfect petri dish for bacterial growth. Do the same for the indentation at the tail set and the outer vulval area. If you have any questions about dealing with skin problems or wrinkle issues, talk with your veterinarian who may prescribe a specific care regime. 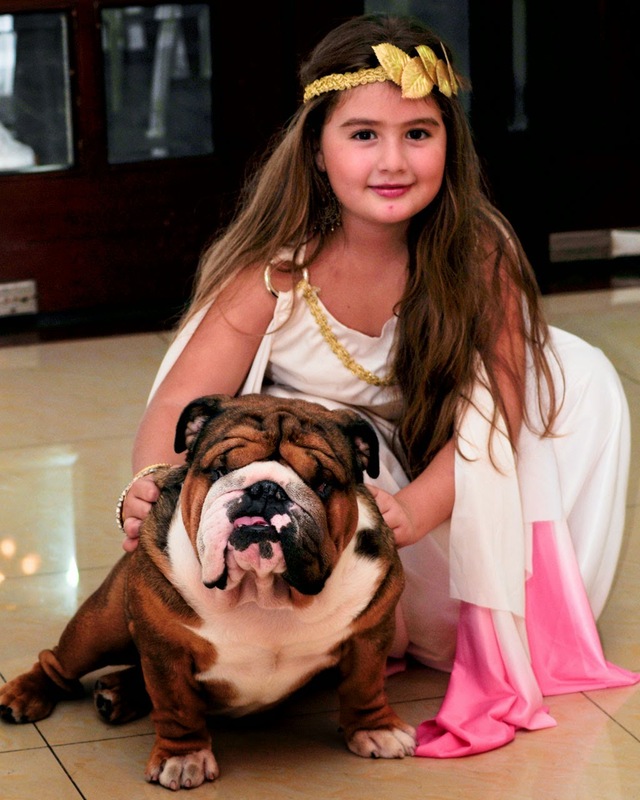 His amiable temperament and bulk make the Bulldog an excellent companion for children, even young ones. A Bulldog will put up with a lot from a child, although he shouldn't have to, and he'll walk away if he gets tired of being tormented. With their pacific nature, Bulldogs also get along well with other pets, dogs and cats. They may be less sociable toward strange dogs, however. The same line of English Bulldogs has served as the mascots for the University of Georgia since 1956, under the name of Uga. Each Uga is issued his own student ID and watches games in an air-conditioned doghouse. 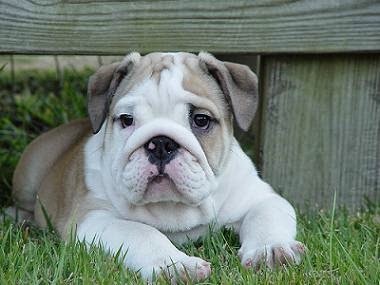 The Bulldog is popularly used to represent England or the United Kingdom. It has been associated with Winston Churchill's defiance of Nazi Germany. The Bulldog breed is the official mascot of the United States Marine Corps, and many bases have their own mascot on base. Thirty-nine American universities use a Bulldog as their mascot including Bryant University, Drake University, Georgetown University, Mississippi State University, Louisiana Tech University, Yale University, The Citadel, The Military College of South Carolina South Carolina State University, and University of Georgia. Bulldogs are the 6th most popular breed in America and French bulldogs are ranked 18th. In Los Angeles though, bulldogs are #1, and French bulldogs are #5, according to the American Kennel Club. Warren G. Harding was the only U.S. President to own a bulldog while in office. His pet bulldog, Oh Boy, passed away early during his term as president, and was replaced by an Airedale terrier, Laddie Boy as First Dog. Brigitte, the bulldog who plays Stella on Modern Family, has the distinction of being the first bulldog to win a Golden Collar award. She beat out dog performers from Chelsea Lately, Hot in Cleveland, Entourage, and Suburgatory. She also beat out the only human competitor, Jason Gann, the star of Wilfred. Bulldogs are one of the most popular mascots for universities and sports teams. Uga, the mascot of the University of Georgia team, is one of the most famous. Sonny Seiler, famed as the attorney of Jim Williams in the book Midnight in the Garden of Good and Evil, is responsible for selecting who will fulfill Uga’s responsibilities. There have been 8 Ugas since 1956, and the search for Uga IX is currently ongoing. Bulldogs were originally bred in England dating back to the 16th century, believed to be a mix of mastiffs and pugs. The English bulldog is what’s most commonly referred to as a “bulldog” but there are popular French and American varieties as well. Bulldogs have suffered the most airline deaths of any breed due to their respiratory issues. They often suffer from hip dysplasia and other medical concerns. Over 80 percent of bulldogs are delivered by Caesarean section. Having been bred with such large heads precludes most bulldog pups from being delivered naturally. Bulldogs, like many brachycephalic (large-skulled) dogs are not well-suited for water and are in danger of drowning when swimming. Many celebrities own bulldogs including Leonardo DiCaprio, Reese Witherspoon, David Beckham, Ashley Olsen, Hugh Jackman, Zac Efron, and Martha Stewart. The famous haute cuisine restaurant elBulli in Catalonia, Spain run by chef Ferran Adrià is named for the French bulldogs belonging to the original owners of the land where the restaurant is located. Do Dogs Recognize our Facial Expressions?